A record-breaking prime resi development in Dublin 4 has just launched its international marketing campaign. Chartered Land’s 215-unit Lansdowne Place scheme is being billed by joint selling agents Savills International and Sherry FitzGerald as “Ireland’s most luxurious residential development”. Over €100m of off-plan sales have already gone through to date, including the exchange of a roof-garden penthouse for a record €6.5m. Lansdowne Place is located in the swish Ballsbridge district in southern Dublin, on the site of the former Trinity College Botanical Gardens. Prices for remaining units range from €800,000 to €2.3m, with apartments from 782 to 1,910 square feet. Most units have ceilin heights tickling nine feet, with floor-to-ceiling windows, sunrooms and balconies flooding interior spaces with natural ligh. Upper level apartments boast some pretty spectacular views across Dublin, with some looking directly onto the Aviva Stadium (home to the Irish national rugby and football teams) and other getting sea views across the bay. Top-end London-based design firm Goddard Littlefair has created interiors, in its first Irish project. GL has gone with a “classic, contemporary” look which aims to “marry the traditional look and feel, present in the surrounding area, with modern luxury”. The team has used natural stone finishes, oak flooring, soft carpeting and polished timber to get the effect, all in a choice of either light or dark palettes. The developer is making a big deal of the scheme’s landscaping, which has been created by Bernard Seymour Landscape Architects. Some of the original specimen plants and trees from the site’s former incarnation (150 years ago) as Botanical Gardens have been retained. Worthy of particular note is a Strawberry Tree, which has been recognised as one the great trees of the country and is protected by the Tree Register of Ireland. Following through on the theme, Chartered Land has named each of the seven buildings after former prominent botanists of Trinity College. Back inside, residents will have access to a range of amenities badged as The Lansdowne Residents Club. This includes a 24-hour concierge service and a purpose-built two-storey leisure facility with lounge, library, meeting room, cinema room, private dining room with separate kitchen, and an outside terrace area. The lower ground floor houses a full-service spa with a gym, fitness studio, sauna, steam room and individual treatment rooms. There’s also parking available in the basement. 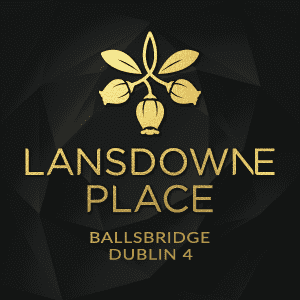 Lansdowne Place is the trophy resi project in a wider “rejuvenation” programme for the Ballsbridge area, spearheaded by Chartered Land. The developer is also delivering “a new luxury hotel and village quarter” in a location more often associated with office space, embassies and sporting grounds (the AVIVA Stadium and the Royal Dublin Society Show Grounds which hosts the internationally renowned Dublin Horse Show). This article originally appeared on the Prime Resi.